A fine art print of "White Birch Forest" will calm your office or bedroom with its soothing light and lush foliage. The white Birch trees reflect and diffuse the available light to create a welcoming understory. A healthy community of ferns add a softness to the scene, welcoming tired minds and wandering eyes. Take a mental hike through Acadia National Park and return refreshed! 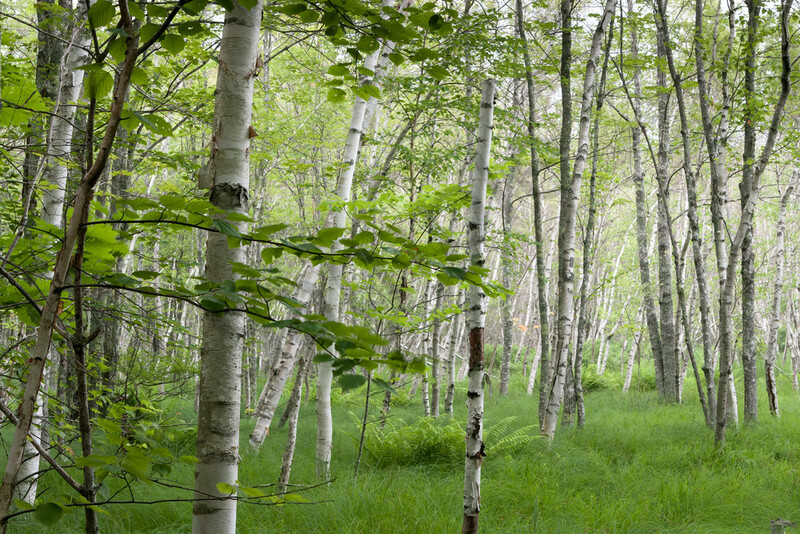 A forest of White Birch trees offers a delight for the senses. The bright trunks and bright green leaves scatter light throughout the understory, reducing the claustrophobic feel found in other hardwood forests. Thin leaves and a mat of ferns shiver in the softest of breezes, adding life to the woodland. The warm light and soft feel of the forest inspires calmness and clarity. "White Birch Forest" is part of my Tree Wall Art series. Best displayed on canvas, the colors achieve a warmth and vibrance that brings the forest to life. Each museum-quality canvas is professionally stretched over a wood frame and ready to hang upon arrival. For a bolder, more modern look, choose a metal print. Two museum-quality fine art papers are also available, should you prefer a more traditional presentation.